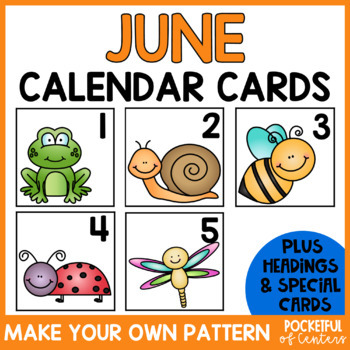 June Calendar Numbers: These calendar numbers are great for a June or Insect/Bug theme! They fit in a pocket chart calendar. There is a complete set (1-31) of each picture: ladybugs, frogs, dragonflies, snails, and bees. You can choose the pattern based on the level of your students: AB, ABC, AAB, ABB etc. There are also calendar cards for holidays, birthdays, and no school days. These numbers are also great to use in a math center for number recognition, number writing, number order, patterning, sorting odd & even, and one to one correspondence! 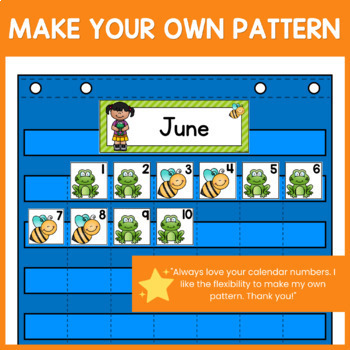 Do you need calendar numbers for the whole school year? 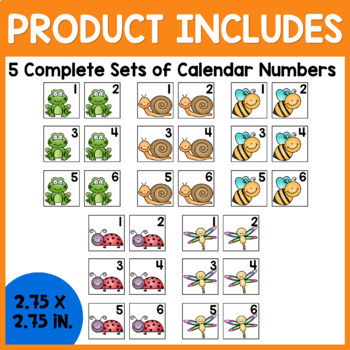 This set is included in my Monthly Calendar Numbers Bundle for a BIG SAVINGS! My Monthly Calendar Headings coordinate with each monthly set.